Honda reliability with the flexibility of a jet drive. The 40 Jet is perfect for boating in locations where normal prop driven boats can’t operate. Rocky bottom shallows, white river rapids, and even over sandbars – your Honda can take you there. The low-profile foot design allows a boater to maneuver in minimal depths without the fear of getting a propeller caught or damaged on rocky, rough bottoms, shallows, or other underwater obstacles. Based on the BF60’s proven platform, the 40 Jet takes everything you love about the BF60 and adds the versatility of a Jet. The best maneuverability. Best in class high output charging. And of course, the best time out on the water. THE BEST CHOICE FOR NAVIGATING IN SHALLOW WATERS: The 40 Jet goes where props can't. 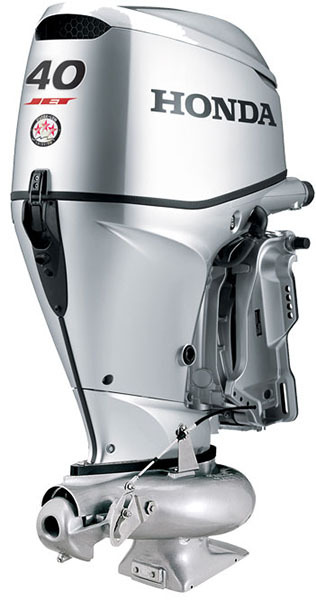 Shallow lakes, rocky rivers, rapids, sandbars - our Jet outboards are ready to explore. SUPERIOR BATTERY CHARGING - MORE USABLE POWER: There's always plenty of electric power with the 40 Jet. Honda's exclusive neodymium magnet flywheel enables these engines to produce nearly twice as many charging amps as some competitors. The high output helps keep battery banks charged all day, even when running multiple accessories. The 40 Jet develops a total 22 amps and 17 charging amps. ENGINE ALERT SYSTEM - KEEPS YOU INFORMED: The Engine Alert System uses visual, audio and RPM reduction circuits to alert the operator of over-heating, low oil PSI and over-revving. This helps to prevent engine damage. 4-FRONT CORROSION PROTECTION SYSTEM - FIGHTS THE ELEMENTS: The Corrosion Protection System is a pateted "Double Sealed" multi-layered paint process. Sacrificial anodes and stainless steel technology, along with waterproof connectors, internally painted cooling passages, and a freshwater flushing device, all enhance corrosion protection. VARIABLE SPEED TROLLING - AVAILABLE ON OPTIONAL TILLER MODEL: For fisherman who want to slow troll, Honda's variable speed control is available on an optional tiller. The system adjusts in 50 RPM increments between 750 RPM and 1000 RPM.